The last leg of our California trip brought us to Paso Robles. When I had made inquiry through friends of friends for recommendations, a few names kept coming up, and Bistro Laurent was one of them. I can now understand why. Every wine region seems to have a place like this (or ought to) - a comfortable restaurant where you can find simple, well-prepared food that compliments the local wines. Bistro Laurent clearly fits that description. I knew that Paso Robles was a wine-producing area that has gotten some attention particularly for Rhone varietals and zinfandels, and was familiar with at least a couple producers (Tablas Creek and Linne Calodo, the latter of which I've been a mailing list customer of). But frankly, I hadn't quite realized how extensive Paso Robles' wine biz had become. There are now over 180 wineries in Paso Robles with 26,000 acres of vineyards, and the publicists claim it is the fastest growing wine region in California. Happily, much of that is still focused on small-production wines from vineyards that are still family-owned. Bistro Laurent, which does double-duty as a wine shop and restaurant, is a good place to sample some of that local product. The restaurant is in a brick building that occupies a corner of the town square. Inside, it's cozy and informal, with exposed brick walls on the interior interspersed with French wine and spirits posters, and along the ledge behind the banquettes, a fine collection of French cookbooks to peruse after you order. The menu offers either a four- or five-course tasting menu in a DIY style with a number of choices (very reasonably priced at $48 or $64), or you can order a la carte. We did some of both. I started with a simple salad of crabmeat paired with some orange segments over a lightly vinaigrette-dressed green salad, the flavors of which were simple and clean. I followed with seared sea scallops served over a textbook ratatouille, a drizzle of a red wine reduction providing a nice bridge for appeasing my prediliction for red wine with seafood (and everything else). Next, duck magret, still nicely rosy pink, served over potatoes macaire (twice-cooked, first baked, then the flesh scooped out, cooled, molded into a disk and then pan-fried till nice and crispy on the outside), also with a red wine sauce, this one bolstered and smoothed out with demiglace. Meanwhile, we also had their onion soup, again a textbook rendition, a couple pizza-like tarts, one topped simply with tomatoes, mozzarella and basil, the other with a nice combination of escargot, pesto and goat cheese, and a perfectly cooked, juicy pork chop. A chocolate pot du creme and creme brulee were likewise fine versions of the classics. The simple bistro fare makes a good foil for the wine list, which features a pretty encyclopedic offering of Paso Robles' finest, including some back vintage options. 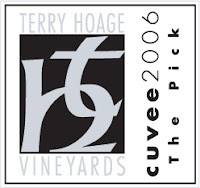 The Rhone Ranger types seemed a particularly good match for the food, and we tried something I had never heard of before, Terry Hoage's "The Pick" (2006). The wine was a GSM (grenache syrah mourvedre) blend, heaviest on the grenache, which was dense with black fruits without being over-ripe or over-sweet, and had a nice backbone of spice. I was happy to discover that the winery was only a couple minutes away from our hotel and paid a visit the next day. Terry Hoage is a former football player (a Georgia Bulldog defensive back who had a 10+ year pro career) and now he and his wife run a small vineyard and winery in the hills of west Paso Robles. Their focus is exclusively on Rhone varietals and total production is about 2,000 cases. The lineup features a grenache blanc / roussanne blend, a rosé of syrah & grenache, a 100% syrah ("The Hedge"), a grenache ("Skins"), and a few blends - "The Pick," a GSM as noted above, "The 46" which is 50/50 grenache & syrah, and "5 Blocks Cuvee" which is a syrah based blend with grenache, mourvedre and cinsault. Both oenophiles and football fans will appreciate the multiple points of reference of the names, and from top to bottom I was really excited by their wines. When you've got good wine like this, you don't necessarily need or even want culinary pyrotechnics with it. 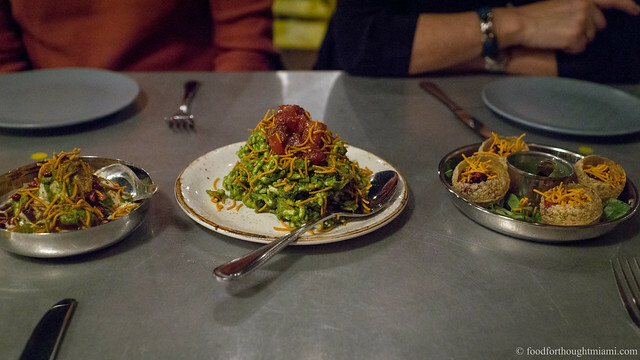 Is the food at Bistro Laurent cutting edge? Innovative? Not even remotely. Is it satisfying, especially together with some of the local juice? Absolutely.